October is the month when everything smells like apples, pears and pumpkins. The apple is the queen of autumn foods and you can make miracles with it – from the simplest bars to the glamorous desserts and cakes. These Caramel Apple Crisp Cheesecake Bars are ideal choice in the autumn season, but also during holidays, which are knocking on the door. I’m sure you agree that it is most beautiful when we can spend this cold, foggy day in the comfort of our own home, surrounded by magical scents and enjoy a delicious bars like this. 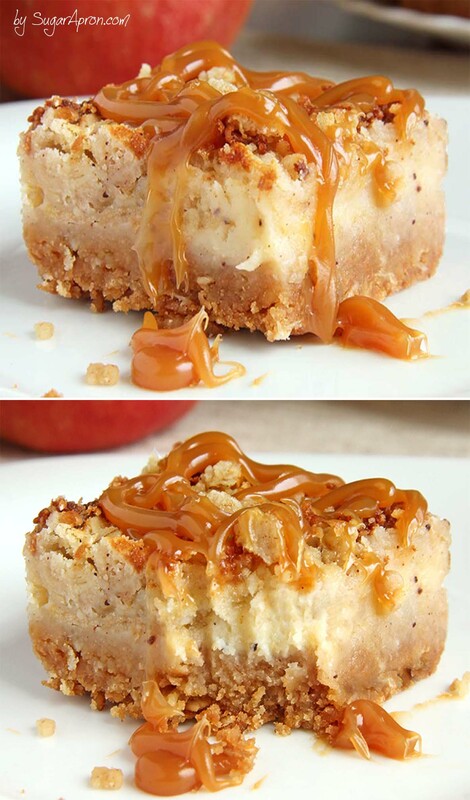 I hope you’ll smell it from the screen 🙂 and you’ll prepare this Caramel Apple Crisp Cheesecake Bars in order to make your day beautiful, and while these bars bake, you house will smell like a fall-scented bakery. No candles required. Because you know how I like to say, happiness is in little things, so we have to take care of ourselves and to make sure that every day is special. Let today stand out and be remembered for an excellent dessert. (be sure to cover the sides, you are going to use this to lift the bars). Press inside the bottom of a 9x13-inch baking pan. Once well combined, pour on top of your graham cracker/oat crust. To start your apple layer, arrange the thinly sliced apple on top of the cream cheese mixture in a single layer. Top with the Apple Crisp Topping. Bake at 350F for 40-50 minutes. Cut into squares. 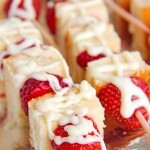 Serve with caramel drizzled over the top of cheesecake bars. This looks so amazing!!! Thanks for linking up with What’s Cookin’ Wednesday! Your cheesecake bars look incredible, Sarah! Thanks Tania @COOKTORIA !Happy baking! My Family members just prefer the tart apples, but You can use any apple. I do not like coconut oil what can I use instead? Hi Sarah, A suggestion for you. On your printable recipes, would you please put “SugarApron” up with the titles of your recipes? As a fellow teacher, I want to be able to give proper credit to the source of such delicious foods. The URL comes at the bottom of the printed version but it is tiny. As a Canadian who moved to Aus we don’t have them here which is a shame. I’ve found that Arnotts nice biscuits work ok.
From what I have found the closest thing to a graham cracker would be your wheatmeal biscuit. Do you need to use coconut oil ? What purpose does it have and can it be subbed for vegetable oil. Thanks it does look delicious. You can make them a day ahead of time, and I would just make sure to not put the caramel on them if you make them ahead of time. Wait to drizzle it on until you serve them. Looks great, can’t wait to try it. What brand of caramel topping did you use? Never had one that looked that good. What kind of apples do you recommend? Thanks for sharing this, thinking about making it for Thanksgivings! I’m jumping in to say that the more tart kinds of apples like the ones you would use to make pie would work better. Ask your produce person what varieties those are. Would this work if I halved the recipe and used an 8 x 8 pan? These look amazing! Thanks for sharing. I was debating between an apple pie or pumpkin cheesecake for dessert and I think you have solved my dilemma! Found this recipe on Pinterest and just made it, it smells delicious and was pretty easy to make, my only suggestion would be doubling the crust or using a smaller pan size because it barely covered the bottom of the pan it says to use, and make sure the cream cheese is VERY softened, mine was room temp and that wasn’t soft enough to mix it well, I ended up microwaving the mix and mixing in about 3, 30 second intervals because it was hard to mix and spreading it over the crust just took the crust with it and I had to mix the little bit of crust in with it and make a new crust in a new pan… I also just diced up the apples and mixed them with the crumble topping and it worked just fine for me. Just thought I’d give some tips if you’re struggling with making this. Thanks for the tips…I had the same problem with the crust and cream cheese not spreading. 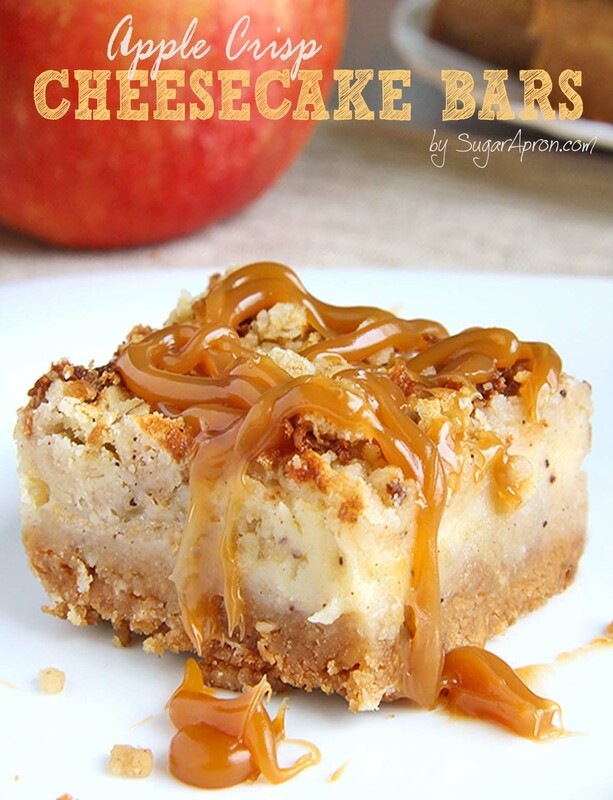 What could possibly be better than caramel apple crisp or cheese cake? Well Sarah, looks to me like you nailed it. AND it is beautiful to the eye !! 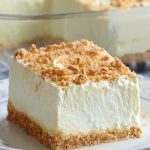 Hi, my cheesecake mixture doesn’t pour, not sure what to do? I just made these a couple of days ago and they are delicious! I love the flavour of the cream cheese with ginger and cinnamon. I am leaving off the caramel topping for two reasons: 1) they are awesome as they are and don’t need to be any sweeter 2) I am using them as finger food and I think the caramel would be too sticky. I might make them sometime as a plated dessert and then would consider a little caramel topping (and maybe a dab of whipped cream). I didn’t have any trouble getting the crust to spread over the bottom of a 9 X 13 pan. I like the idea of adding chopped apples to the crisp topping. Slicing the apples was the only fiddly part of this. I expect I will make this again. 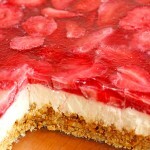 Hi these look amazing…just wondering if anyone has tried freezing them would it be OK? What exactly do you do with the coconut oil, was listed in ingredients but not in the directions. These are wonderful. I doubled the crisp topping and added pecans. 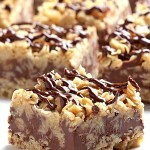 thank you for the recipe, made these multiply times already and we never get tired of them! These sound so good. You top the apple layer with Apple Crisp Topping. Did I miss that part or do you just make your own recipe? My husband is allergic to coconut and I was wondering what I could substitute for the coconut oil? When you stated to line the bottom of the pan with foil for easy removal, was that for either type of pan you mentioned or only for the foil pan? I am making these to take to work on Monday (4/4/16), which is National Caramel Day. What could I use instead of coconut oil? It’s not in our budget for a spoonfuls. Wow! Recipe is printing now…looking forward to the smells and taste of this treat. Was this recipe suppose to have eggs in the filling? How do I know when it is done? Does the knife come out clean? Bake at 350F for 40-50 minutes.Then you can use a knife. These are absolutely AMAZING!!!! Perfect in every aspect. Thank you for sharing your amazingness with the world!! Great recipe, can you bake these as cupcakes? If so, at what temp and how many minutes? You can take a butter at room temperature. Well I made these. But there was no pouring of the cheesecake layer. Did you mean to add eggs? I had to plop it in and it lifted up the bar crust when I tried to spread it around. Looks good but feel like something is missing? This looks so good! What a yummy one to make for fall company!